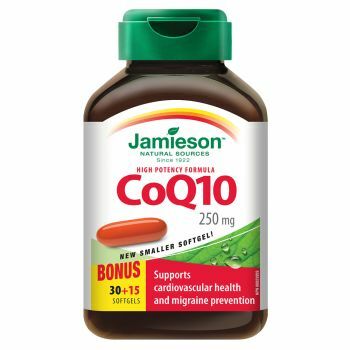 Jamieson CoQ10 250 mg formula is a high potency anti-oxidant ideal for maintaininggeneral health and supporting a healthy cardiovascular system. In addition to anti-oxidant and energy support, higher-dose CoQ10 helps reduce the frequency of migraine headaches and associated nausea and vomiting. 'Helps to maintain cardiovascular health. An antioxidant for the maintenance ofgood health. Supports healthy CoQ10 levels for patients prescribed statin drugs"